Proper care for the Lady Gouldian Finch, especially learning the best techniques for Gouldian finch breeding can appear to be very complicated. A lot of conflicting information is readily available. There are a million or more products on the market that promise to be the missing and needed medication or supplement to assist hobbyists and also for successful Gouldian finch breeding. Don’t be overwhelmed and don’t be misled. I am Jeanie Ferguson, the founder and former owner of Flexibleflyers’ Aviary in Maryland. For years I bred, raised and sold stunning quality Lady Gouldian Finches, and I have accumulated a great deal of knowledge on this topic. It is my hope that this site, guide book and my free monthly ezine, full of tips will enhance your experiences while living with the Lady Gouldian Finch. I was introduced to the wonderful world of finches by accident when I became a volunteer in the Rain Forest at the National Aquarium in Baltimore, Maryland. It took a few years, but in 1990, I founded Flexible Flyer’s Aviary. I set out breeding the Lady Gouldian Finch. Raising healthy, beautiful finches with the intention of increasing their availability in the market place. While doing just that, I have acquired a wealth of experience and knowledge on this subject and it is with this site that I am eager to make that information easily available to all who are hopeful and caring owners of Lady Gouldians. I am determined to do the best I can to see to it that Lady Gouldian Finches live long, happy, healthy lives. Breeding Lady Gouldians, learning about them and living with them has been fantastic for me. I believe that you too will find these tiny companions bring so much more than just beauty into your lives. These delicate little bird are intelligent, inquisitive, friendly, hardy, active, non-destructive, and easy to maintain. Lady Gouldian Finch are, in general, quiet although males do have a pleasant melodious song. They are appreciated for their beautiful colors, erect posture, graceful shape and peaceful temperament. I have just published my new ebook about LGF care and especially about Gouldian finch breeding. Click the link above to learn more about this invaluable book! Now my new ezine subscribers will also be able to download the brand new, free “Lady Gouldian Finch 14 Health Care Tips” free Report with some of my best Gouldian Finch Health Care advice. Get Your Free Lady Gouldian Finch Tips Ezine and Report Today! I promise to use it only to send you Lady Gouldian Finch Tips. As soon as you confirm your subscription to my free monthly magazine, you will get the download link to my new report: “Lady Gouldian Finch 14 Health Care Tips” with some of my best Gouldian Finch Health Care advice. Gouldian Finch Care Guide prepared by a Lady Gouldian Finch Breeding Expert. Ask your questions here and Jean Ferguson will answer them right here online! 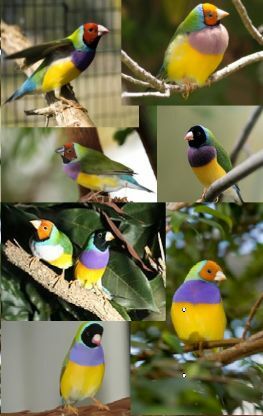 Gouldian Finches Photos And Videos submitted to the Lady Gouldian Finch Breeding Expert Guide – Share your favourite Gouldian Finch Photos with our readers! Lady Gouldian Finch Expert Guide for the care and breeding of Gouldian Finches.